‘Two teas,’ Martin’s voice rumbled from below. In a manner characteristic or reminiscent of Ireland or the Irish. Also occas. : in a seemingly contradictory fashion. Declining a cup of tea when really you’d like one (you may even ‘murder a cup’) certainly qualifies as Irishly contradictory – as does Mrs Doyle’s marvellous deployment of You won’t have a cup as another way of insisting on a cup. This entry was posted on Wednesday, March 1st, 2017 at 8:19 pm and is filed under books, dialect, Hiberno-English, humour, Ireland, language, pragmatics, words. You can follow any responses to this entry through the RSS 2.0 feed. You can leave a response, or trackback from your own site. Does Fr Kinsella ever think or behave Americanly? The -sh/-ch nationalities seem to work better here: Irishly, Englishly, Britishly, Scottishly, Frenchly, Dutchly v Germanly, Italianly, Canadianly, Australianly, Japanesely. Or it just might be that the -sh/-ch nationalities all have one or two syllables and the -sh/-ch isn’t a morpheme in its own right. Therefore, Germanly is the one on the second list which goes closest to working. Not as obviously as the priests behave Irishly; he’s more a foil for their personal conflicts than a strong character in his own right. I think Germanly (and Russianly, etc.) works as well as Irishly & co., for reasons of stress and syllabicity. Italianly and Australianly are a little awkward because -lian doesn’t take -ly smoothly. That works, or even Ozly. Now I’m trying to think of something that would oscillate Aussily. A movie was made of Catholics, starring Martin Sheen: https://en.wikipedia.org/wiki/Catholics_(film). It made a big impression on me as a young man. Thanks, Will – I’d be interested to see it. Likewise Black Robe, another short religious novel by Moore, which was filmed in 1991. “To put it Irishly, I thought he [a horse] wasn’t an awful looking yoke” (2009), where the Irishness is in vocabulary, not in logic. Wonderful! Thank you, John. It’s also interesting from a purely editorial point of view to see the different parenthetical techniques used. I’d forgotten all about that scene. Thanks for the laugh. Islands off the west coast of Ireland? Priests, repression and unleashed passions? Read Liam O’Flaherty’s novels! 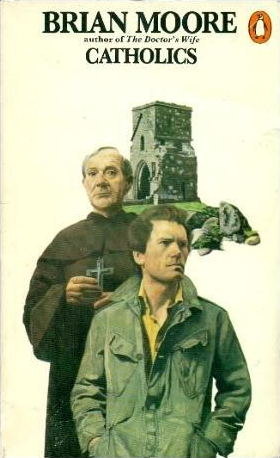 You might be interested in the movie made of Catholics starring Martin Sheen and filmed on my beloved island Sherkin off West Cork. Great book too. Read the Good Doctor last year and loved it. And Father Ted. A rich post indeed Stan. Definitely, yes, WWW. I didn’t know it was filmed on Sherkin. I’ll watch it sometime once the novel has faded from memory. In the meantime I look forward to reading The Good Doctor – and the many other unread Moores awaiting their turn.